Welcome to our annual celebration of reading, the YISS 2016 Elementary School Read-A-Thon. Our goal is to develop a lifelong love of learning and promote the enjoyment of reading through a variety of fun and educational activities. 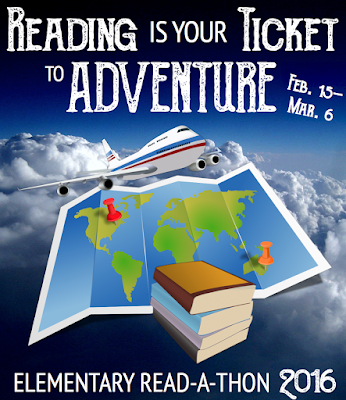 The theme this year is "Reading is Your Ticket to Adventure" and will begin on Monday, February 15 and end on Monday, March 7.
competition for prizes will be highlighted as well. Like last year there will be a school wide goal for minutes read. If the Elementary School students can collectively read a total of 654,321minutes, Mrs. Willetts, Mr. Garman and Mrs. Roll have agreed to the Pie throw at the Wrap-Up Assembly. Reading any type of text and any genre if in balance (reading a variety of different types of texts): Comics, newspaper, magazines, books, articles, poetry, graphic novels, etc. Reading textbook for homework purposes or reading textbook in class. All we can say is that it will be mysterious! All students, teachers, administrative staff and parent volunteers are invited to come to school dressed in their PJs and enjoy a pancake lunch on Wednesday, February 24. You are welcome to “Snuggle Up and Read” your favorite book that day. All students, teachers, and administrative staff to come to school dressed as a favorite book character from an adventurous story. Bring a favorite quote from the book to share! For the duration of Read-A-Thon, we are dedicating 20 minutes of every school day to Drop Everything and Read (DEAR). DEAR time is for everyone to read, adults and students in the school community. You can read anything you wish to; books, magazines, comic books, non-fiction, newspapers, etc. These 20 minutes count towards your reading log. IMPORTANT REMINDER:This year, we have included a column with the DEAR minutes for your convenience. Please add the time read and combine with 20 DEAR minutes to calculate daily totals. Students who are “Caught Reading” on camera will find themselves featured on the “Readers Wall Of Fame”. All students, teachers, administrators will celebrate the end of Read-A-Thon and if the Elementary School collectively reads 654,321 minutes, Mrs. Willetts, Mr. Garman and Mrs. Roll have agreed to the Pie throw at the Wrap-Up Assembly. In addition, names will be drawn for prizes. Thank you in advance for your participation and for helping celebrate the joy of reading.